After the divorce, Mrs Adriana lived on her own. She worked full-time in her own perfumery, which was well on its way, and allowed her an easy, carefree life. Every evening, upon coming home, she relaxed by filling the bathtub and spending some twenty minutes in the water. Night after night, Adriana was having enough of staring at the same boring white wall. It had been her ex-husband’s choice. Once again Adriana wondered why had she married a man so devoid of imagination. Yet she loved elegant, exclusive things; things he was totally incapable of understanding. Along the years, some of the tiles had come off; and where they had been replaced, you could tell the difference. Yes! This is what I need, thought Adriana. I am still young and good-looking, she said to herself resolutely. I want the wall of my bathroom to carry a reproduction of the most beautiful lady, in the most beautiful bath setting of them all! This is what Mrs Adriana was thinking, as she called us to order a mosaic for her bathroom. Upon her request we designed Botticelli’s «Venus», with the goddess of beauty being born from the foam of the waves of the sea. Now let’s not get carried away! Everybody is not going to have Botticelli’s Venus on the bathroom wall: maybe for most people it’s a bit too much. However Mrs Adriana had done something right: she didn’t stop at the first choice; she wanted her home to reflect her inner self, and she acted accordingly. This is a good tip for anybody who are setting themselves to building or renewing their home. Coatings for bathrooms and kitchens can be found anywhere; they are possibly the most widely available building commodity. However quaint may this sound, it is a fact that this great availability makes the choice harder. There’s a hundred thousand models out there, each with its own shape, colour, size, material. How should one make a choice? And what if one does make a choice, and the next day stumbles upon something he likes more? Renewing home is an investment. Having a new one built, more so: and we all want an investment to be carefully chosen, so that it does not lose value with time, and even more, we want it to be «the right one». I was a teenager in the early 1970s. The Protest Movement of 1968 was in its full blow, and it was bringing a wave of innovation in the whole world. Of that time, I cherish the memory of how we used to dress. In some ways it was absurd: we wore trousers with a drop waist and bell bottoms, colourful floral shirts with long-tipped collars, boots, and other extravagant accessories. I remember we used to do this, because we wanted to «feel different», especially from the generations before our own. The outcome however was comic: with our long hair and hippy clothes, we ended up looking all the same. The Seventies went by; I graduated from University and took up a job. The old bell-bottoms and hippy shirts were out of style; new trends had established. I quickly realised I was not interested in the new fashion. Instead, I developed my own style as a dandy: elegant cotton or silk shirts, bow ties with thin paisley patterns, woollen trousers with razor-sharp edges, English made shoes. I soon learned to choose the best suppliers: the old lady in the tiny shop, with a refined selection of ties in every style; the factory of men’s suits, which offered a tailor service to loyal customers; the silk import firm, with a vast selection of first-class shirts. Sometimes I would make a mistake, and end up with something I refused to wear. But I quickly learned how to make my choices. The point is that not every day does one have to choose a coating. On the contrary, most people who buy a house, or build their own, make this choice only once in a lifetime. It is a remarkable fact, that a choice which will give its effects along the years, maybe the decades, is often made superficially, or maybe by only considering technical features – hardness, wear resistance, non-slip finish – and underestimating the visual impact. Yet more so when the house, which is being built or restored, must live up to the high expectations of an owner, who only wants the best. Let us see how to avoid the seven most common mistakes. Are we sure we really want the bathroom tiled in that nameless light beige? Of course we read the architecture magazines, which advise the use of light colours to make rooms more luminous. However, it must also be remembered that the bathroom is one of the rooms in which we spend quite some time… in total intimacy, alone with ourselves, and to many people the bathroom is where they can relax, and find time for themselves. Some read a newspaper, others catch up on their profession; others still, with the ever-present smartphone placing the world in our hands, will watch videos or listen to music. So let’s work up a bit of nerve, and bring out the grain of folly that we all carry in ourselves. Beige tiles can be all right; but let us break the monotony with a colourful inlay, small but visually imposing. 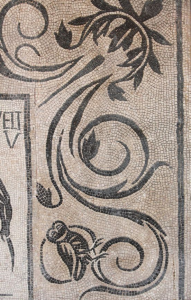 We suggest an «a strappo» mosaic, which is a mosaic whose borders are not geometrically defined. It is the ideal choice to lend some colour to a room, which would otherwise be on the verge of boredom. It was a trend of he 1980s: a black-tiled bathroom is classy and elegant. Nowadays it is much less seen; and architects from the magazines advise against using colours that are too dark – and so do architects «live». But here’s a brilliant idea: accompany the black stoneware on the walls, with a pavement in black-and-white Roman marble mosaic. You can choose your patterns from the rich decorations of Imperial age baths: this is the easiest choice, though not the most original one. Otherwise you can have them made for you, following your own taste and likings, which will result in a unique, one-time work of art, in which the charm of ancient opulence joins present-day creativity. The owner of the house will have the choice of either leaving the cut marbles raw, which results in an effect of movement, and a higher slip-resistance, even when barefooted or wet; or have the floor polished up, to give the surface physical uniformity and smoothness. Let us not forget that rooms coated in tiles or mosaics are those rooms in which we spend most of our time at home: kitchen and bathroom. I read an aphorism, many years ago, which has turned into something of a motto for me: «Important persons are to be received in the living rooms; friends, in the kitchen». In the past twenty years I moved five times. In each of the homes, the kitchen was regularly one of the most welcoming, cosiest rooms. One of the houses had actually two kitchens. Is it really worth saving money, in decorating those rooms in which we are going to spend our quality time? Of course it is not. 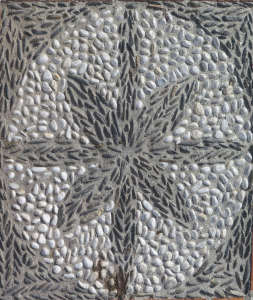 So choose your tiles with care, add mosaic inlays, or maybe a floor decoration taken from a Roman bath, or still the pavement of the shower made in Genoan «rissêu». No compromise in order to express the top of yourself, in an environment in which you have the right to feel a king. Do not make the mistake of considering gaps between mosaic tiles just as «wasted space waiting to be grouted up»! 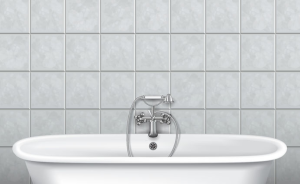 It is true that some manufacturers offer grouts and sealants, which can be used to fill, level and straighten the gaps in a composition made of conjoined elements, such as a tiled or mosaic-covered wall. But the same manufacturers also have a limitless fantasy; our own provider of choice, MAPEI, sells a full range of sealants, in different colours and formulas – including, for instance, the one you need to grout the coating of a swimming pool, which is subject to the aggressive action of chlorine water. So please let us not consider gaps just as «wasted space». Come on, use your fantasy! And if you have none, enlist the support of someone who does, who will help you out. Gaps in mosaics are composing elements. We have always firmly believed as much, and we were happy to have our belief backed up by the late master Dario Narduzzi, once director of one of the oldest, most prestigious mosaic ateliers in the world: the Mosaic Study at the Vatican in Rome. Tiles, after tiles, after tiles. Blah blah blah. From end to end, or rather from floor to ceiling. At the time of our grandparents, this was how coatings were made. Boring, monotonous, without the slightest hint of fantasy. 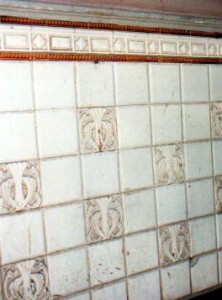 Then in the 1980s tile manufacturers began offering modular products: uniform tiles for the background, and geometric or floral motives for the framing edges. This breaks monotony down, and makes the end result more interesting and personal. Yet there is more that can be done. Instead of following the manufacturer’s indications of using components in the same series, we can experiment by joining different series. The result will be even more original, more «our own». One further step ahead consists of putting together components of different series, harmonising them in a creation of our own, and adding some parts in mosaic, which we have had made just for our very own. It might be an abstract motive, a meander, or we might replace a few tiles with mosaic compositions made for the purpose. This will make the place like no other. Remember what we mentioned above, about friends being received in the kitchen. It is not just when friends come to visit: even when we are on our own, within the intimacy of our family, we want our kitchen to be appealing, comfortable, and original. Kitchen fittings, which are to be found on magazines, are often very beautiful; however, precisely because they are published on a magazine, they cannot be considered as one-of-a-kind. We can add some fantasy here, of course taking care not to fall into bad taste. When planning for the kitchen, a common mistake in choosing coatings is thinking only of function and forgetting beauty; ending up with kitchens all white, like operation theatres: certainly clean, but banal. An interesting compositional element which offers large opportunities for creativity is the backsplash, that is the wall behind the stove and/or the washbasin. As its name suggests, this is that part of the wall which will receive the splashes during cooking. Therefore, its two main requirements are: resistance to corrosive elements, and hygiene. Many of the ingredients in what we eat are corrosive: tomato sauce, lemon juice, vinegar. An inappropriate surface, such as a porous or exceedingly raw one, will soon be damaged. In addition, everything around the cooking stove must be easy to clean, so as to remove food remains and dirt, which endanger the food we prepare. 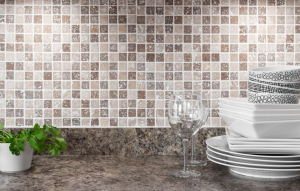 Mosaic lends itself well to making backsplashes; it must be especially designed, in order to make its surface as smooth as possible, and the gaps filled with grout that makes them waterproof and easy to clean. An idea which is even more interesting, consists of a collection of mosaics made of the two backsplashes – behind the stove and above the washbasin – and inlays within the doors of the cabinets. If well planned, the collection gives a warm, enveloping and cosy impression, like nothing you may have seen anywhere else. In the open, mosaic is yet an easier choice. Its resistance to weather and accidents is proverbial; and opportunities for composition are unlimited, so that even the most demanding house owner will find something up to his palate. 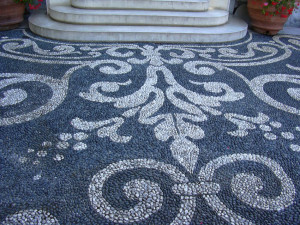 Think of Roman mosaics, or the vision of Antoni Gaudì; of Genoan or Greek pebble mosaik, or of venetian «Terrazzo»; the design can be integrated in several different elements, which make unique creations possible. For instance, the path leading to the swimming pool can bear a design which merges with the decoration of the coating of the pool itself. Salespersons of coatings often do mean well …but the materials we find around, as seen above, are always the same. After all, the salesperson will always offer those products, which assure him a higher margin; he will sell them to as many clients as possible, and these will all wind up with the same bathroom and the same kitchen. Stepping out of monotony is possible, and we have shown you how. It is your turn now: do not let anyone choose in your place.